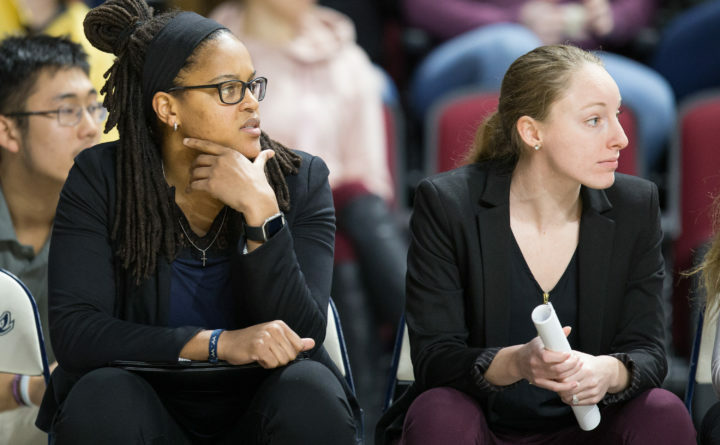 University of Maine women's basketball assistant coaches Jhasmin Player (left) and Courtney Anderson England look on from the bench in this March 14, 2018, file photo. Jhasmin Player’s second stint as an assistant coach with the University of Maine’s women’s basketball program has come to an end. Player has left UMaine to become an assistant at the University of Loyola Marymount in Los Angeles. Player began her second stint at UMaine in 2016. She was first the director of basketball operations, player development and community relations, and was then promoted to assistant coach/recruiting coordinator. She had previously served as an assistant coach from 2011-13 before resuming a professional playing career in Poland. The Bay City, Texas, native had played professional basketball in Portugal in 2009 and in Spain the following season. “I’m thrilled to say that we hit a home run with Jhasmin Player. She has a history of excellence from her playing days at Baylor to her recruiting success at Maine, particularly in the international scene,” Charity Elliott, who is beginning her seventh season as the head coach at Loyola Marymount, said on the Loyola Marymount athletic website. “What stood out to me was her combination of confidence and humility. Our players are going to love the passion and experience she brings, and on the recruiting side, she will hit the ground running,” she added. The Lions went 20-11 last season and lost to San Francisco in the West Coast Conference tournament quarterfinals. On her facebook page, Player wrote, “Man, this past nine days has been a whirlwind. I’m thankful for it all though! And she had provided special thanks to head coach Amy Vachon. Player was a two-year captain at Baylor University in Texas and helped lead the team to four NCAA tournament appearances. She was an All-Big 12 second-team and All-Defensive Team selection during her career and was named to the Big 12 All-Tournament team her senior year (2009).